As the third Central Districts race meeting in the space of five days, Bathurst Thoroughbred Racing manager Michelle Tarpenning was not sure how well her club’s program this afternoon would be supported. But on Thursday morning when the nominations for today's seven-race meeting were released, Tarpenning liked what she saw. In total the meeting attracted 63 nominations, with the 1400m maiden only two short of capacity. “With Dubbo racing last Thursday and Orange on Saturday – we are all drawing from the same pool of horses – I was very happy with that result,” she said. “We’ll probably have a few come out, but I felt it was quite good given the other racing in the area. 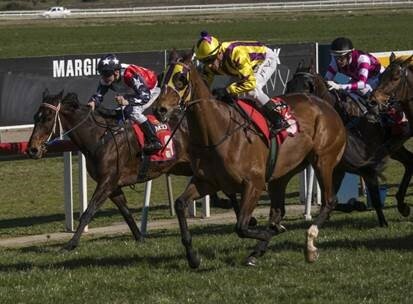 Both Mirfin (Key Master-$1.80 favourite on TAB fixed odds) and Stanley (Dungannon-$12) are set to have hopefuls square off in the Class 2 Plate (1400m) while the Bathurst trainers will also have maiden runners go head-to-head. As for the track, which staged an eight-race Country Showcase meeting last Sunday week, will again be in good condition. “It’s looking really good, it’s a Good 3 at the moment because we’ve been irrigating a lot after our big Showcase meeting. It’s been rolled and patched and looking great, we are very fortunate with the state of our track given all the warm weather we’ve been having,” Tarpenning said. Today's first race jumps at 2:05pm.